Amazon.com sells a lot of other stuff besides books. One of its most intriguing offerings is the SweatEvaporating/Sauna/HealthyUrn/NanoAnion/NegativeIon/FarInfraredRay/Hyperthermia/Fumigate/PulseMagneticField/PurpleClay/Underglaze Pastel And Yellow-glazed—Lotus Out Of Clear Water. I am not making this up: http://www.amazon.com/gp/offer-listing/B019QTUIA2/ref=dp_olp_new?ie=UTF8&condition=new. Embedded 2200pcs Health-rock Gemstone by specific rules, healthy urn manufacturing procedure would go through nine processes, such as mud-mading,carving, firing, moulding, open-air drying, grinding and so on. When temperature inside healthy urn can be to 42-47¡æ by two-in-one regulator putting vapour of steamy-fumigating pot into urn, health-rock gemstone will release a large number of anions and far infrared rays to form an enclosed pulsed magnetic field. With five-in-one therapy which is combined with anions, far infrared rays, fumigating, hyperthermia, and pulsed magnetic field therapy, healthy urn can cause human body to expel aging wastes and activate cells¡¯ activity, which can reduce burdens on kidneys and liver, also can improve absorption function of human circulation system and muscle tissue. As immunology theories, natural curability of human body can strengthen around 6 times when body temperature rises 1¡æ, and strengthen around 36 times when body temperature rises 2¡æ. 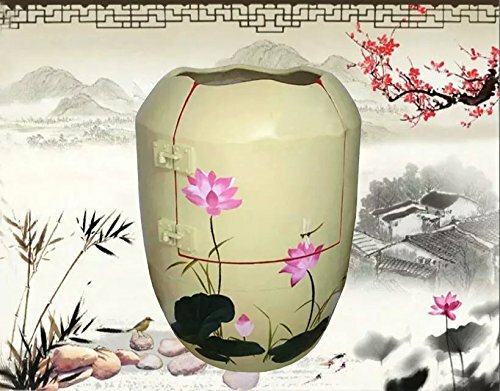 So when body temperature rises 1-2¡æ in healthy urn, human body will achieve efficacies, such as unimpeded meridian, five viscera balance, endocrine balance, anti-free radical activity, blood cleaning and so on. Healthy urn can recuperate diseases as below: Opening human body sebaceous glands and dredging the third-expelling channel for deep-layer sweat by far infrared rays, fumigating, hyperthermia, and nuclear magnetic resonance, healthy urn whose detoxifying effect is to 90% can promote metabolism, regulate endocrine, dredge vein. replenish anion, improve immunity, improve natural curability and so on. The name SweatEvaporating/Sauna/HealthyUrn/NanoAnion/NegativeIon/FarInfraredRay/Hyperthermia/Fumigate/PulseMagneticField/PurpleClay/Underglaze Pastel And Yellow-glazed—Lotus Out Of Clear Water is to product names as Llanfairpwllgwyngyllgogerychwyrndrobwllllantysili-ogogogoch is to town names. (A nice little town in Wales. I visited there once, and quickly learned how to pronounce its name correctly and then forgot just as quickly.) They definitely need a better, shorter name for marketing. The ancient Greeks used a type of large ceramic jar called an amphora to store and transport wine. So I propose the name CAMphora, since this product combines several Complementary/Alternative Medicine therapies to offer “health in a jar.” True, the traditional amphora had two handles, and this jar has none; but it’s close enough for a company that thinks the language in their product description is close enough to English. The Sungao company sells it for $24,600 with free shipping from China (but possibly with import fees or customs duties?). They offer other versions with different artwork for $26,900. They also sell purely decorative vases with no health claims. I was unable to find out anything about the company. There is a #sungao with pictures of swimwear. When I first learned of this product, I thought “This has to be a spoof; please, please tell me it’s a spoof!” I wrote Amazon to ask if it was a real product and if anyone had actually bought one; they didn’t answer. The claims go on and on, promising to cure “tumor, fatigue, depression, insomnia, neurological diseases and so on.” It’s really entertaining to read as an example of sciencey-sounding twaddle. It’s also entertaining as an example of incompetent translation from Chinese. You will be reassured to know that it is environmentally friendly, with energy-saving performance, low-carbon environmental protection, noiseless, lightless and pollution free. Of course, they don’t provide any scientific references to support their claims; and surprisingly, they don’t even offer the usual testimonials. They don’t even explain how you use it. Do you sit inside it? Does it accommodate people of all sizes and shapes? Do you have to add Chinese herbs? How often do you use it and for how long? It mentions “Capacity-2000 volt.” What do you suppose that means? It sounds scary. I’ve come across a lot of nonsense in alternative health claims, but this one takes the cake. It’s right up there with Ancestor Bands, those colored silicone bracelets with “embedded frequencies” that promise to help you tap into the proper frequencies that your Ancestors transmit throughout the Cosmos to impart their newfound universal knowledge of the universe and increase your mental power, physical strength, and reverse the effects of aging. “Try it today, feel the difference tomorrow.” (https://www.sciencebasedmedicine.org/frequencies-and-their-kindred-delusions/) You might feel a difference with Ancestor Bands, but you are guaranteed to see a difference in your financial status if you invest in a CAMphora. If it’s true that laughter is the best medicine, just reading about this jar might be therapeutic. On the other hand, it might make you cry. It’s discouraging to think that there might be someone out there with more money than sense who would fork out $24,600 for this “health in a jar.” And to think that there are people unscrupulous or deluded enough to sell those jars.